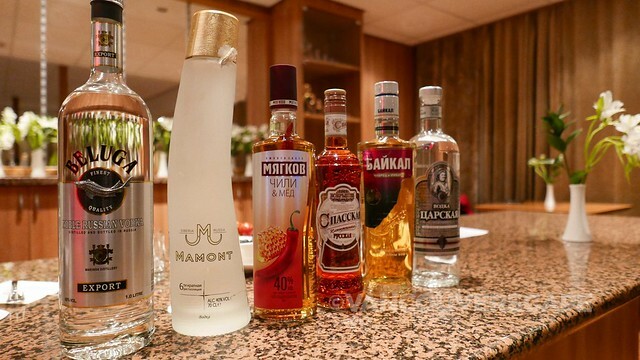 On a cruise through Russia’s waterways, a vodka tasting is bound to make the rounds at some point. 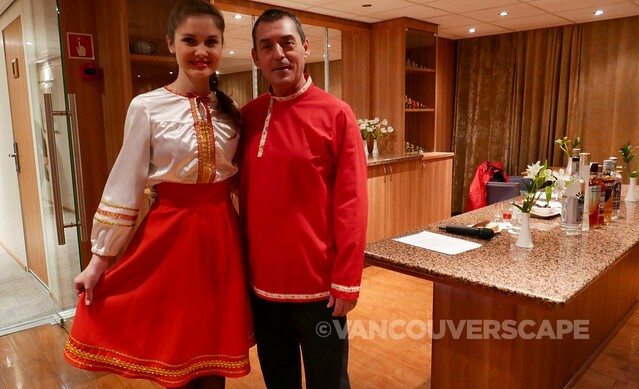 We sampled six vodkas—three flavoured, three regular in the ship’s lounge while en route to our next port, Yaroslavl. In case you didn’t know, vodka was first produced at the end of the 9th century however it wasn’t until two centuries later that the first known distillery began at Khylnovsk. During the Middle Ages, vodka was primarily used for medicinal purposes — and as an ingredient in gunpowder! In the 14th century, it became known as Russia’s national drink, with Poland and Finland declaring it theirs in the mid-16th century. As vodka production increased, it began to be exported. Sweden was the first to receive it. Aromatic vodkas were also produced, using cherry, ginger, hazelnut, juniper, lemon, mint, pepper, raspberry, sage, watermelon and other ingredients. Following the Russian Revolution, the Bolsheviks confiscated private distilleries, causing several Russian vodka producers to emigrate, along with their recipes and skills. Smirnoff set up the first vodka distillery in Paris in 1934, together with a Russian émigré from the US. Soon after, vodka gained popularity internationally. 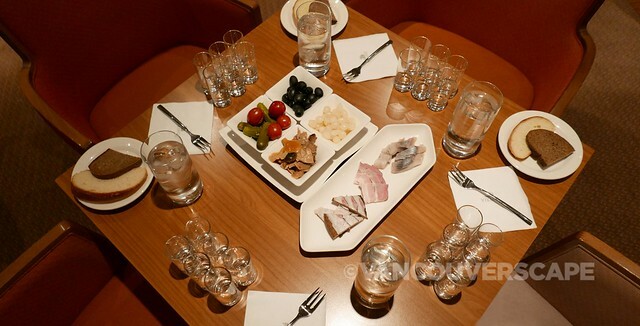 On our tasting tables are pickled veggies, pearl onions, bread, herring, olives and an assortment of thick-cut bacon. And six shot glasses. In other words, vodka goes with everything and is best served cold. Caviar is a must if you can afford the good black variety that’s become scarce over the years. Tsarskaya (aka Vodka for the Czars), from St. Petersburg, is a smooth introductory vodka that was brought to the market for St. Petersburg’s 300th birthday. Baikal comes from the region of the same name and this particular variety of Baikal is infused with thyme and herbs, containing water from Bailkal lake, a body of water with a depth of 500 meters. It’s smooth and very approachable. For me, this is the winner and sadly, I tried but never found it in any of the stores. Spasskaya is the main tower of the Kremlin, and a cranberry-flavoured vodka from Novgorod. It’s got a mild sweetness and is easy to sip. Myagkov is a heartier vodka infused with honey and peppers and comes from Arkhangelsk. Our fifth sipper, Malont, is also one of my faves of the bunch. 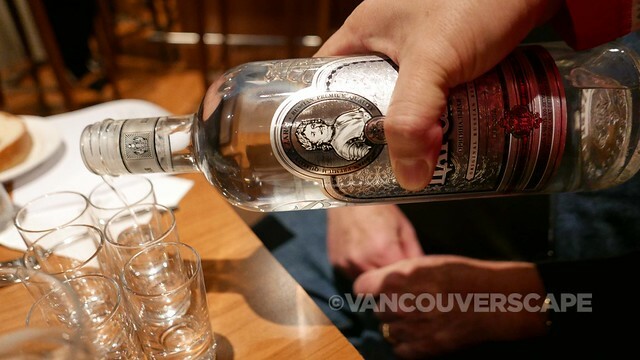 It’s produced in Siberia at a distillery founded in 1868 that uses water from the Altai mountains. To cap off the evening and many toasts, Beluga Noble is poured into our sixth glass. This St. Petersburg vodka is produced in an untouched corner of Siberia, 300 km from the nearest settlement. The beautiful bottle contains a hand-made beluga on the front. Pickle juice is known as a great hangover cure. If you can stand drinking this, the remedy will balance the salt in your blood stream. Gorbachev initiated an anti-alcohol campaign during his time in office, hoping that Russians would lead a healthier life as a result. Obviously this didn’t last too long. There are no limits on alcohol purchases in Russia but you can’t buy any between 11 pm and 10 am. Russian vodka-tasting snacks are called zakuska. Vodka will freeze at -50C. Siberia has long, cold winters that often see temps falling below that number, so they’ve been known to slice a chunk of frozen vodka and place it between two slices of bread for a vodka sandwich to warm up! 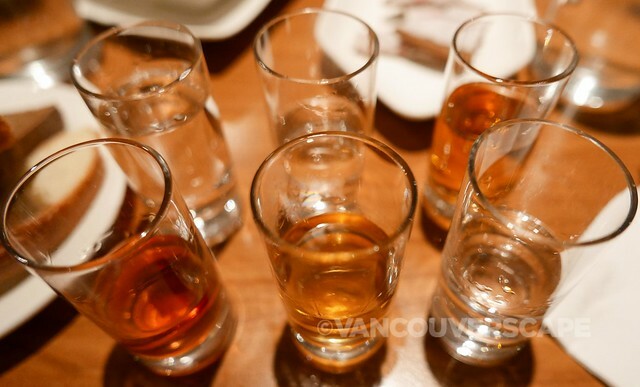 Russians always clink glasses when toasting with vodka.